The production of immunosuppressive cytokines, such as IL-10 and TGF-β, has been documented in individuals diagnosed with active tuberculosis. In addition, IL-10 production is increased within the lungs of mice that have chronic mycobacterial infection. Therefore, we hypothesized that the down-regulatory properties of IL-10 might contribute to the reactivation of chronic Mycobacterium tuberculosis infection in mice. To determine the influence of IL-10 on the course of infection, transgenic mice producing increased amounts of IL-10 under the control of the IL-2 promotor were infected with M. tuberculosis via the respiratory route. Mice that overexpressed IL-10 showed no increase in susceptibility during the early stages of infection, but during the chronic phase of the infection showed evidence of reactivation tuberculosis with a highly significant increase in bacterial numbers within the lungs. Reactivation was associated with the formation of macrophage-dominated lesions, decreased mRNA production for TNF and IL-12p40, and a decrease in Ag-specific IFN-γ secretion. These data support the hypothesis that IL-10 plays a pivotal role during the chronic/latent stage of pulmonary tuberculosis, with increased production playing a potentially central role in promoting reactivation tuberculosis. It is estimated that one-third of the world’s population harbors an infection with Mycobacterium tuberculosis, of which ∼3 million individuals go on to develop active disease each year (1). The factors that contribute to an individual’s susceptibility to reactivate an apparently latent M. tuberculosis infection are currently unknown, although malnutrition and immunosupression are among some of the suggested reasons (2, 3). A current area of active research is that of determining genetic linkage for susceptibility to develop reactivation tuberculosis. In man, several genes such as Nramp1 (4, 5), 15q, and Xq (6) have been linked to tuberculosis suggesting that susceptibility cannot be conferred by a single gene alone but is in fact multifactoral in nature. This theory is supported by studies in the mouse model that have identified associations with loci on chromosomes 3 and 9 (7), the H-2 locus (8), and more recently the sst1 gene (9), suggesting that susceptibility is very unlikely to be mapped to a single gene. Therefore, the identification of immune correlates of protection may be a more feasible approach with which to identify the very large number of latently infected individuals who are at risk of developing reactivation disease. Using mouse models of reactivation tuberculosis, we have previously demonstrated that mouse strains such as the CBA/J and DBA/2 fail to up-regulate the cell surface adhesion molecules CD11a and CD54 on their circulating lymphocytes during an infection with M. tuberculosis (10). The failure of circulating T cells to increase their expression of adhesion molecules correlated with the absence of lymphocyte foci within the lung granulomas. We hypothesized that this absence of lymphocytes contributed to the eventual breakdown of the lesion and reactivation of tuberculosis, and that the measurement of CD11a and CD54 expression on circulating lymphocytes might be a useful correlate of protection. It is likely that the failure to up-regulate the expression of these molecules is the consequence of an upstream event, although the mechanisms contributing to this event in the reactivation susceptible mouse strains are currently unknown. In this regard, IL-10 is a cytokine that has been shown to have immunosuppressive activity that may contribute to mycobacterial disease. In the presence of IL-10, it has been shown that both T cell proliferation and IFN-γ production is inhibited (11, 12, 13, 14) and the action of IL-10 has been linked to its down-regulation of macrophage activation. IL-10 can inhibit TNF and NO secretion (15, 16), down-regulate the expression of costimulatory molecules (11), and MHC class II (16, 17); therefore, it compromises both macrophage microbicidal mechanisms and Ag presentation. The ability of IL-10 to down-regulate immune responses and the fact that IL-10 can be detected in tuberculosis patients (18, 19) have led researchers to investigate whether IL-10 plays a role in susceptibility to tuberculosis. More specifically, it has been suggested that the removal of IL-10 will enhance protective immunity. Despite the known immunosuppressive properties of IL-10, infection of IL-10 gene-disrupted mice with Mycobacterium bovis bacillus Calmette-Guérin resulted in only a small and transient increase in resistance to infection, and the outcome of chronic disease was unaltered (20, 21). More significantly, infection of IL-10 gene-disrupted mice with M. tuberculosis resulted in either a minor increase in resistance (22) or no increase at all (23). The studies described used gene-disrupted mice that were bred onto a naturally resistant mouse strain, capable of generating a vigorous immune response during M. tuberculosis infection and showing no signs of reactivation disease until well into old age (24, 25). In this regard, we hypothesized that if C57BL/6 IL-10 gene-disrupted mice were slightly more resistant to tuberculosis, the overexpression of IL-10 may result in an increased susceptibility of this mouse strain to infection perhaps more akin to the susceptible mouse strains that we have previously characterized. To determine whether increased IL-10 production can influence the outcome of disease, we chose to study M. tuberculosis infection in transgenic C57BL/6 mice that express IL-10 under the control of the IL-2 promoter (IL-10 transgenic mice) (26). These mice thus generate excess IL-10 when the IL-2 gene is induced, such as occurs during the vigorous response seen in M. tuberculosis-infected C57BL/6 mice. Our data demonstrate that the increased production of IL-10 during an infection with M. tuberculosis conferred a reactivation susceptible phenotype on the naturally resistant C57BL/6 mouse strain. Lesions within the lungs of IL-10 transgenic mice were dominated by macrophages, mRNA for TNF and IL-12p40 was reduced in the lung, and the capacity of lung cells to secrete Ag-specific IFN-γ was compromised. This phenotype closely resembles that seen in the reactivation susceptible mouse strains. The demonstration that lesions within the lungs of CBA/J mice infected with M. tuberculosis contain substantial levels of IL-10 supports the hypothesis that this cytokine plays a major role in the development of reactivation tuberculosis in man. These studies were performed using specific pathogen-free C57BL/6 and CBA/J mice (The Jackson Laboratory, Bar Harbor, ME) at 6–8 wk of age. The IL-10 transgenic mice were a kind gift from Drs. H. Cheroute and M. Kronenberg (La Jolla Institute for Allergy and Infectious Disease, La Jolla, CA) (26). Mice were kept in ABL-3 biohazard conditions throughout the study and maintained on sterile chow and water ad libitum. The specific pathogen-free nature of the mouse colonies was demonstrated by testing sentinel animals. These were shown to be negative for 12 known mouse pathogens. All experimental protocols were approved by the Colorado State University Animal Care and Users Committee. M. tuberculosis strain Erdman was grown from low passage seed lots in Proskauer-Beck liquid media containing 0.02% Tween 80 to mid-log phase, then aliquoted and frozen at −70°C until use. Mice were infected via the aerosol route with a low dose (102) of bacteria. Briefly, the nebulizer compartment of a Middlebrook airborne infection apparatus (Glas-col, Terre Haute, IN) was filled with 5 ml of distilled water containing a suspension of bacteria known to deliver ∼100 bacteria/lung. The numbers of viable bacteria in the lungs were followed against time by plating serial dilutions of individual partial organ homogenates onto nutrient Middlebrook 7H11 agar and counting bacterial colony formation after 21 days incubation at 37°C. The data were expressed as the log10 value of the mean number of bacteria recovered from four individual animals. The right caudal lung lobe from each mouse (n = 4/group) was infused with 10% neutral-buffered formalin. Tissues were sectioned for light microscopy with lobe orientation designed to allow for the maximum surface area of each lobe to be seen. Sections were stained with H&E. Sections were examined by a veterinary pathologist without prior knowledge of the experimental groups, and evaluated at least twice to verify the reproducibility of the observations. Formalin-fixed lung tissue was embedded in paraffin, and serial sections of tissue were cut 7-μm thick. Paraffin was removed using EZ-DeWax solution (BioGenex Laboratories, San Ramon, CA), and the Ag retrieval procedure was performed using the Ag Retrieval Citra solution according to the manufacturer’s protocol (BioGenex Laboratories). Tissue endogenous peroxidase was inactivated using peroxidase block reagent (Innogenex, San Ramon, CA) and nonspecific binding blocked by incubating the sections for 30 min with 5% mouse serum (Sigma-Aldrich, St. Louis, MO). The sections were incubated overnight at 4°C with goat polyclonal Ab specific for murine IL-10, or an irrelevant IgG goat Ab (Santa Cruz Biotechnology, Santa Cruz, CA). The sections were washed with PBS containing 0.5% Tween 20 followed by incubation with the secondary polyclonal donkey anti-goat Ab conjugated to HRP (Serotec, Raleigh, NC) for 40 min at room temperature. Samples were developed using AEC substrate (BioGenex Laboratories). Sections were counterstained using hematoxylin (BioGenex Laboratories) and mounted using crystal mount. Mice were euthanized and the pulmonary cavity opened. The lung was cleared of blood by perfusing through the pulmonary artery with 10 ml of saline containing 50 U/ml of heparin (Sigma-Aldrich). Lungs were removed from the pulmonary cavity and placed in cold DMEM (Life Technologies, Grand Island, NY). After removal of the connective tissue and trachea, the lungs were disrupted using sterile razor blades and incubated for 30 min at 37°C in a final volume of 2 ml DMEM containing collagenase XI (0.7 mg/ml; Sigma-Aldrich) and type IV bovine pancreatic DNase (30 μg/ml; Sigma-Aldrich). Ten milliliters of DMEM containing supplements (10% heat-inactivated FCS; Life Technologies), 1% 1 M HEPES buffer (1 M; Sigma-Aldrich), 1% l-glutamine (200 nM; Sigma-Aldrich), and 2% MEM-nonessential amino acids (100×; Sigma-Aldrich) was added to stop the action of the enzyme. Digested lungs were then gently dispersed through a nylon screen, and centrifuged at 300 × g. Remaining RBCs were lysed using ACK lysis buffer (0.15 M NH4Cl, 1.0 mM KHCO3). Cells were resuspended in DMEM plus supplements. Spleens were harvested from individual mice and the cells dispersed through a nylon screen. RBCs were lysed using ACK lysis buffer (0.15 M NH4Cl, 1.0 mM KHCO3) and spleen cells were resuspended in DMEM plus supplements. Cells from the lung or spleen were obtained from each individual mouse and incubated with specific Ab (25 μg/ml) for 30 min at 4°C and in the dark followed by two washes in D-RPMI lacking biotin and phenol red (Irvine Scientific, Santa Ana, CA). Cells were analyzed using a BD Biosciences FACSCalibur and data analyzed using CellQuest (BD Biosciences, San Diego, CA). Lymphocytes were gated by forward and side scatter, and CD4+ and CD8+ T cells identified by the presence of specific fluorescent-labeled Ab. Cell surface markers were analyzed using FITC-labeled anti-CD11a (clone 2D7) and PE anti-CD54 (clone 3E2), PerCP-labeled anti-CD4 (clone RM4-5), and allophycocyanin-labeled anti-CD8 (clone 53-6.7). Appropriate isotype control Abs were included in each analysis. All Abs were purchased from BD PharMingen (San Diego, CA). Measurement of intracellular IFN-γ was conducted by preincubating lung cells with 0.1 μg/ml anti-CD3ε (clone 145-2C11) and 1 μg/ml anti-CD28 (clone 37.51) in the presence of 3 μM monensin for 4 h at 37°C, 5% CO2. Cells were stained with Abs for cell surface molecules as described above before a permeabilization step conducted according to the manufacturer’s instructions (Fix/Perm kit; BD PharMingen). FITC anti-IFN-γ (clone XMG1.2) or IgG1 isotype control Ab was incubated with the cells for a further 30 min, washed twice, and resuspended in D-RPMI before analysis. Lung cells were resuspended at 5 × 106 cells/ml in DMEM plus supplements. Cells were cultured with OVA (10 μg/ml; Sigma-Aldrich), or culture filtrate proteins (CFPs)3 from M. tuberculosis (10 μg/ml; received from National Institutes of Health contract AI-75320). After 5 days of culture at 37°C and 5% CO2, the plates were frozen at −70°C until further analysis. Supernatants were harvested from lung cell cultures and assayed for the presence of IFN-γ and IL-10 by ELISA. Briefly, the primary Ab (IFN-γ clone R4-6A2, IL-10 clone JES5.2A5; BD PharMingen) was incubated overnight in 96-well round bottom Immulon 2 plates in carbonated coating buffer. Excess Ab was washed away using PBS-Tween 20. The wells were blocked with 3% BSA in PBS-Tween 20. The samples were dispensed in duplicate into the wells. A standard curve was prepared using IFN-γ (Genzyme, Cambridge, MA) or IL-10 (BD PharMingen) for each individual plate. Cytokine production was detected by the addition of a secondary biotinylated Ab (IFN-γ clone XMG1.2, IL-10 clone SXC-1; BD PharMingen) and followed by avidin-peroxidase (Zymed Laboratories, San Francisco, CA) and 3,3′,5,5′-tetramethylbenzidine substrate (DAKO, Carpinteria, CA). A portion of lung tissue was suspended in Ultraspec (Cinna/Biotecx, Friendswood, TX), homogenized, and frozen rapidly for storage at −70°C. Total cellular RNA was extracted and reverse transcribed using murine Moloney leukemia virus reverse transcriptase (Life Technologies). PCR was performed with specific primers for IL-2 or IL-10. The PCR product was Southern blotted and probed with specific labeled oligonucleotides, and the blots were developed using the ECL kit (Amersham, Arlington Heights, IL). The hypoxanthine phosphoribosyltransferase housekeeping gene was also amplified for each sample and used to confirm that equivalent amounts of readable RNA were present in all the samples. Alternatively, the detection of IL-10, TNF, or IL-12p40 mRNA was conducted using a TaqMan 7700 real-time PCR machine (Applied Biosystems, Foster City, CA). For quantification purposes, Ribosomal DNA for each sample was also assayed as an endogenous normalizer. Quantification of message was conducted using the Delta Delta Ct method. Statistical significance was determined with the Student’s t test and was found to be significant when p < 0.05, or highly significant when p < 0.005. To determine whether the production of IL-10 could contribute to the susceptibility of CBA/J mice to reactivate M. tuberculosis infection, we stained sections of lung tissue from CBA/J and C57BL/6 mice for the expression of IL-10. As early as 50 days postinfection with M. tuberculosis, high levels of IL-10 could be detected within the lesions of CBA/J mice (Fig. 1⇓, A and B). IL-10 was predominantly found within the macrophage populations at the center of the lesions, and could also be detected within bronchoepithelial cells lining the airways. After 150 days of infection with M. tuberculosis, abundant IL-10 could be detected in macrophages within the lung lesions from CBA/J mice (Fig. 1⇓, E and F). In contrast, the lung lesions of C57BL/6 mice contained only occasional macrophages and endothelial cells that stained weakly positive for IL-10 after 50 (Fig. 1⇓, C and D) or 150 days (Fig. 1⇓, G and H) postinfection. CBA/J mice infected with M. tuberculosis produce abundant IL-10 within the macrophage-dominated lesions of the lung. Lung tissue sections from CBA/J and C57BL/6 mice were collected 50 and 150 days postinfection with M. tuberculosis. Tissue was sectioned and labeled with anti-IL-10. IL-10 was found within the foamy macrophages at the center of the granuloma of CBA/J mice after 50 (A and B), and 150 (E and F) days infection. Very little IL-10 was detected within the lungs of C57BL/6 mice after 50 (C and D) and 150 (G and H) days infection. Figures are representative of three independent experiments. Magnification ×40 (A, C, E, G) and ×400 (B, D, F, H). To determine whether naturally reactivation-resistant C57BL/6 could reactivate M. tuberculosis infection if they produced increased IL-10, we infected mice that were capable of overexpressing IL-10 (IL-10 transgenic mice) and monitored the bacterial growth over time. Whereas C57BL/6 mice were able to contain the bacterial load within the lungs for the duration of the experiment, the lung bacterial burden of IL-10 transgenic mice increased significantly during the latter part of the study to ∼2 log more than the controls (Fig. 2⇓). The increase in bacterial numbers within the lungs of IL-10 transgenic mice occurred at a similar rate to that seen in the reactivation-susceptible CBA/J mouse strain. IL-10 transgenic mice are susceptible to reactivation tuberculosis. C57BL/6 (•) CBA/J (▪) and IL-10 transgenic mice (▴) were infected with ∼102 viable M. tuberculosis Erdman via the respiratory route and the CFU within the lung calculated at specific time points postinfection. Data represent the mean ± SEM from four mice at each individual time point and are representative of three independent experiments. Statistical significance was calculated and found to be highly significant (∗∗, p < 0.005) between C57BL/6 mice and both CBA/J and IL-10 trangenic mice. To determine whether IL-10 was being produced in response to mycobacterial Ag, lung cells were harvested from individual mice and incubated with CFPs from M. tuberculosis. Lung cells from IL-10 transgenic mice produced significantly more IL-10 than wild-type C57BL/6 mice both 21 and 50 days postinfection when cultured with CFP (Fig. 3⇓). Ag-specific IL-10 production could not be detected in lung cell cultures from CBA/J mice. Comparable levels of IL-2 mRNA could be detected within the lungs of C57BL/6 and IL-10 transgenic mice during the infection, and IL-10 transgenic mice produced up to 4-fold more IL-10 mRNA within the lungs compared with wild-type mice, as determined by RT-PCR (data not shown). IL-10 transgenic mice produce more IL-10 in response to infection with M. tuberculosis. Lung cells from individual C57BL/6 (□), CBA/J (▨), or IL-10 transgenic mice (▪) were cultured with CFP from M. tuberculosis for 5 days at 37°C, 5% CO2. IL-10 secretion in the culture supernatants was measured by ELISA and expressed as the mean ± SEM for four individual mice at each time point. Results are representative of three independent experiments. Statistical significance was determined between C57BL/6 mice and CBA/J or IL-10 transgenic mice and found to be significant (∗, p < 0.05) or highly significant (∗∗, p < 0.005) where indicated. We have previously demonstrated that circulating lymphocytes isolated from reactivation-prone mice failed to express the adhesion molecules CD11a and CD54 as brightly on their surface as similar cells from C57BL/6 mice (10). Indeed, IL-10 exposure has also been shown to decrease the expression of CD11a on the cell surface of lymphocytes (27). CD4 T cells isolated from the spleen of CBA/J mice expressed less CD11a on their surface (Fig. 4⇓), as we have previously demonstrated (10). The failure to increase CD11a expression was evident up to 120 days postinfection, demonstrating that this was not a transient event in the CBA/J mouse strain. CD4 T cells from the spleens of IL-10 transgenic mice expressed a moderate expression of CD11a on their surface, equivalent to CD4 T cells from the spleens of C57BL/6 mice (Fig. 4⇓). Expression of CD11abright on CD4 T cells isolated from the spleen. Spleen cells were isolated from M. tuberculosis infected C57BL/6 (□), CBA/J (▨), or IL-10 transgenic (▪) mice throughout the course of the study and labeled with fluorescent Ab specific for CD4 and CD11a. Data are expressed as the percentage of CD4 positive cells that expressed high levels of CD11a on their surface (A) and represents the mean ± SEM from four mice at each individual time point. Results are representative of two independent experiments. Statistical significance was calculated and found to be highly significant (∗∗, p < 0.005) between C57BL/6 mice and CBA/J mice where indicated. Representative histograms depicting expression of CD11a on CD4 T cells after 120 days infection with M. tuberculosis. C57BL/6 (shaded histogram), CBA/J and IL-10 transgenic (open histogram) are shown (B). TG, transgenic. Analysis of the local influence of IL-10 production on the expression of CD11a within the lungs demonstrated that CD4 T cells from both CBA/J and IL-10 transgenic mice expressed less CD11a on their surface than CD4 T cells isolated from the lungs of C57BL/6 mice (Fig. 5⇓, A and B). In addition, lung digests revealed that CBA/J and IL-10 transgenic mice had fewer CD4 T cells within the lungs in comparison to the C57BL/6 mouse strain (Fig. 5⇓C). Expression of CD11abright on CD4 T cells isolated from the lung. Lung cells were isolated from M. tuberculosis-infected C57BL/6 (□), CBA/J (▨), or IL-10 transgenic (▪) mice throughout the course of the study and labeled with fluorescent Ab specific for CD4 and CD11a. Data are expressed as the percentage of CD4 positive cells that expressed high levels of CD11a on their surface (A) and represents the mean ± SEM from four mice at each individual time point. Results are representative of three independent experiments. Statistical significance was calculated and found to be significant (∗, p < 0.05), or highly significant (∗∗, p < 0.005), between C57BL/6 mice and CBA/J mice, or C57BL/6 mice and IL-10 transgenic mice, where indicated. Representative histograms depicting expression of CD11a on CD4 T cells after 21 days infection with M. tuberculosis are shown. C57BL/6 (shaded histogram), CBA/J or IL-10 transgenic (open histogram) (B). Absolute number of CD4 T cells within the lungs of C57BL/6 (□), CBA/J (▨), or IL-10 trangenic (▪) mice are shown (C). IL-10 production can down-regulate macrophage responses, which subsequently influence the capacity of the host to generate a T cell-mediated response. To determine whether IL-10 overproduction could influence the immune response within the lungs of IL-10 transgenic or CBA/J mice, we quantified the amount of TNF and IL-12p40 mRNA during the course of infection. The overexpression of IL-10 in the IL-10 transgenic mice correlated with delayed expression of TNF mRNA in the lungs of these mice when compared with the expression in C57BL/6 mice (Fig. 6⇓A). The expression of TNF mRNA was more substantially delayed in CBA/J mice, and this also correlated with the high levels of IL-10 seen in the lung lesions of these mice (see Fig. 1⇑). The pattern of IL-12p40 expression in both the IL-10 transgenic and CBA/J mice was markedly different from that seen for the C57BL/6 mice in that both mice expressed low levels of IL-12p40 mRNA in the lungs throughout infection (Fig. 6⇓B). TNF and IL-12p40 mRNA production within the lung during infection. Lung tissue was obtained from C57BL/6 (•), IL-10 transgenic (▴), or CBA/J (▪) mice throughout the course of infection. RNA was extracted and analyzed using primers and probes specific for TNF (A) or IL-12p40 (B). Data were normalized for the amount of RNA added to the reaction using 18S as a control. By its immunoregulatory action on the macrophage, IL-10 can also influence Ag-specific IFN-γ production (11, 12); therefore, we determined whether mycobacterial-specific IFN-γ production was also reduced in the lungs of IL-10 transgenic mice. Lung cells were isolated from mice that had been infected with M. tuberculosis and cultured with CFP Ags from M. tuberculosis. Ag-specific IFN-γ production was reduced in the lung cell cultures of CBA/J and IL-10 transgenic mice when compared with similar cultures from C57BL/6 mice (Fig. 7⇓). IL-10 transgenic mice produce less IFN-γ in response to infection. Lung cells from individual C57BL/6 (□), CBA/J (▨) or IL-10 transgenic mice (▪) were cultured with CFP from M. tuberculosis for 5 days at 37°C, 5% CO2. IFN-γ secretion in the culture supernatants was measured by ELISA and expressed as the mean ± SEM for four individual mice at each time point. Results are representative of three independent experiments. Statistical significance was calculated and found to be significant (∗, p < 0.05), or highly significant (∗∗, p < 0.005), between C57BL/6 mice and CBA/J mice, or C57BL/6 mice and IL-10 transgenic mice, where indicated. A major characteristic of M. tuberculosis infection in the reactivation prone mouse strains is the predominance of macrophage type lesions within the lung. To determine whether the increased expression of IL-10 and associated decreased expression of CD11a on lymphocytes was associated with the formation of macrophage-dominated lung lesions, lung tissue was collected, sectioned, and stained with H&E. C57BL/6 mice developed characteristic lesions (25) consisting of epithelioid macrophages associated with prominent intralesional scattered or aggregated areas of lymphocytes that persisted until at least 200 days (Table I⇓ and Fig. 8⇓, A and B). 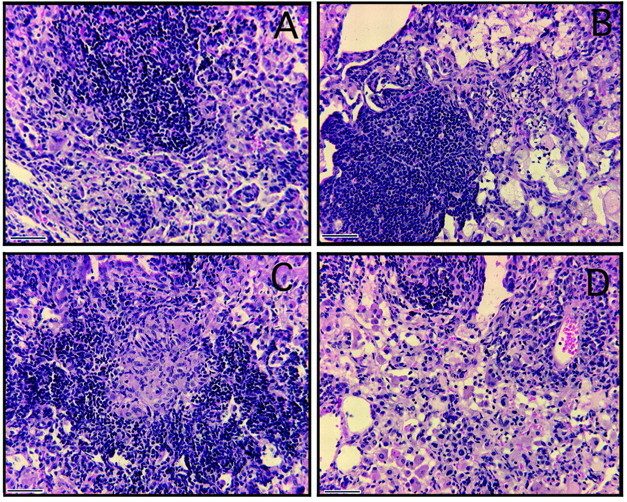 Initially, the lesions within the lungs of IL-10 transgenic mice resembled those seen in the C57BL/6 strain with prominent lymphocytic perivascular/peribronchiolar accumulations and abundant macrophage clusters (Fig. 8⇓C, day 50). However, of particular interest was the observation that after 200 days of infection with M. tuberculosis, only a few loose lymphocyte aggregates were observed. The lesions had progressed to consist predominantly of foamy macrophages (Fig. 8⇓D, day 200) with cellular necrosis, and cholesterol deposition similar to that observed in the lungs of reactivation-prone mouse strains. IL-10 transgenic mice generate macrophage-dominated lesions during chronic M. tuberculosis infection. Formalin-fixed tissue was prepared and sectioned for light microscopy. The tissue was stained with H&E. C57BL/6 mice developed characteristic lesions consisting of epithelioid macrophages associated with prominent intralesional scattered lymphocytes (A; day 50), that persisted throughout the infection (C; day 200). The lungs of IL-10 transgenic mice showed perivascular/peribronchiolar lymphocytes associated with abundant macrophage clusters (B; day 50) which developed into lesions consisting predominantly of foamy macrophages, with cholesterol deposition and necrosis (D; day 200). Magnification ×200, bar = 100 μm. Figures are representative of two independent experiments. 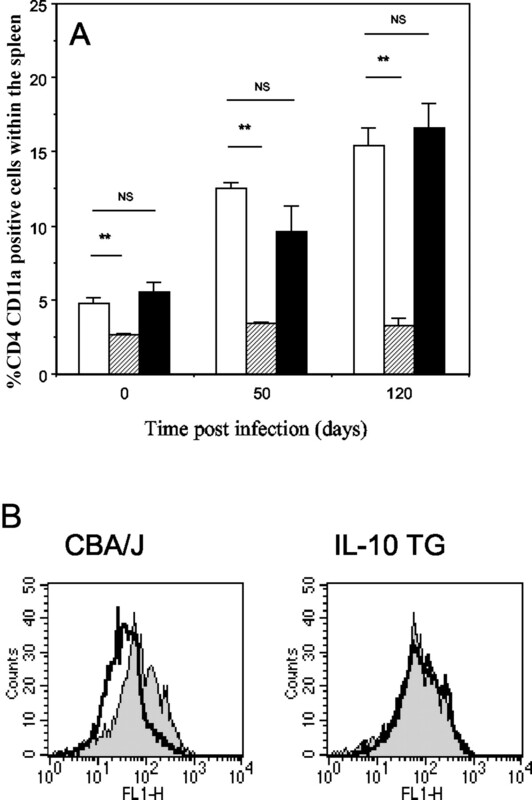 In these studies, we demonstrate that IL-10 could be detected within the lesions of CBA/J mice as early as 50 days postinfection with M. tuberculosis, suggesting that IL-10 may influence the ensuing immune response and subsequent susceptibility to reactivation disease in this mouse strain. To fully determine whether IL-10 had any influence on the course of chronic tuberculosis, we infected C57BL/6 transgenic mice that express IL-10 under control of the IL-2 promoter (26) with M. tuberculosis. Infection resulted in the increased production of IL-10 within the lungs of IL-10 transgenic mice. The most significant finding was that although IL-10 transgenic mice could initially control an infection with M. tuberculosis, as the period of infection progressed into the chronic/latent phase they began to show signs of reactivation disease. Therefore, these findings demonstrate that the addition of a single cytokine, IL-10, resulted in a reactivation-susceptible phenotype in a naturally reactivation-resistant C57BL/6 mouse strain. Our results also confirm findings by Murray et al. (28) in which the overexpression of IL-10 led to increased growth of M. bovis bacillus Calmette-Guérin within the spleen and liver of mice. These data support the hypothesis that the increased production of IL-10 is a potential immune correlate of susceptibility to reactivation tuberculosis, and may be the underlying trigger for this event. In a mouse model of progressive primary tuberculosis, IL-10 was not detected until at least 6 mo (180 days) following an infection with M. tuberculosis (29), and we demonstrate in this study that the C57BL/6 mouse strain produced very little IL-10 during chronic M. tuberculosis infection. These results suggest that the production of IL-10 is not associated with the initial control of infection, but that this cytokine may be more important during the chronic or latent phase of tuberculosis in this model. Therefore, this may explain why only a moderate and transient enhanced early resistance can be found when C57BL/6 IL-10 gene-disrupted mice are infected with mycobacteria (20, 21, 23, 30). This increased resistance to infection in the absence of IL-10 is documented to be associated with an increased expression of inflammatory mediators such as TNF (21), inducible NO synthase (21), and IL-12 (23). Although IL-10 appears to reduce the production of these and other inflammatory molecules (16, 31), the transient and minimal reduction in bacterial numbers early in the course of infection of IL-10-deficient mice suggests that this molecules does not act to limit early protective responses in vivo. Although early protective mechanisms appear unaffected by IL-10, we clearly show in this study that the expression of IL-10 during chronic infection is detrimental to both the protective antibacterial response and to the development of stable mononuclear granulomas. The overexpression of IL-10 in the IL-10 transgenic mice clearly correlates with the reduced expression of the cytokines TNF and IL-12p40, which are not only antibacterial, but also important in the generation of stable granulomas (32, 33, 34). That this reduced cytokine expression is also seen in the CBA/J mice, which also expressed high levels of IL-10 in the lung (albeit from macrophages rather than T cells), suggests that IL-10 is an active down-regulator of protective responses in the chronically infected murine lung. Why the early protective response is unaffected by IL-10 expression when the response within the chronically infected lung is altered poses an interesting question for further study. It is likely that the potent TH1-inducing nature of M. tuberculosis (33, 35) overrides any early inhibitory IL-10 effects, but that as disease develops, the levels of IL-10 increase (artificially in the IL-10 transgenic and naturally in the CBA/J mice) and the cytokine is able to limit the expression of protection. Enhanced resistance to infection with other pathogens has also been demonstrated in IL-10 gene-disrupted mice (36, 37). However, it is also apparent that despite reducing bacterial numbers, the failure to down-regulate an acute immune response can also be fatal to the host due to the generation of an overwhelming inflammatory response (38, 39, 40). That IL-10 does not appear to be essential for the control of an infection with M. tuberculosis, or that its absence does not result in progressive inflammatory responses within the lung suggests that the down-regulation of the immune response to M. tuberculosis could be mediated by an independent mechanism. Alternatively, we demonstrate in this study that the overexpression of IL-10 results in the exacerbation of disease; therefore, it seems possible that a continued immune response during chronic M. tuberculosis infection may in fact be critical for the containment of a long-term infection. Studies that have sought to determine the immune parameters that are required for the maintenance of a chronic infection with M. tuberculosis have identified numerous molecules that include T cell subsets (41, 42), TNF (43, 44), and NO (45). It is also of interest to note that these same molecules are required for the initial control of infection (46, 47, 48), adding further support to the hypothesis that a continued immune response is necessary to prevent the reactivation of infection in the mouse model. As we have demonstrated, the overexpression of IL-10 in our model was associated with a reduced capacity of lung cells to produce IFN-γ in vitro in response to CFP Ags from M. tuberculosis, thus demonstrating that the Ag-specific response could be compromised. The presence of IL-10 within the lungs of infected mice also inhibited the further recruitment of lymphocytes into this organ, demonstrated by the finding that in comparison to wild-type mice, overexpression of IL-10 resulted in fewer CD4 T cells within the lungs during the infection. The production of IFN-γ per cell was not dramatically altered (C57BL/6 1.4 × 10−3; CBA/J 1.6 × 10−3; IL-10 trangenic 0.98 × 10−3 pg/ml); however, the significantly reduced number of T cells within the lungs of IL-10 transgenic and CBA/J mice would also result in a net reduction of IFN-γ within the lungs. Perhaps of more importance was the finding that those CD4 T cells present within the lungs of IL-10 transgenic mice also failed to up-regulate the expression of CD11a on their surface. IL-10 has been shown to influence the expression of CD11a on the surface of T cells (27), and may have a local influence on lymphocytes as they enter the lungs, down-regulating the expression of CD11a and influencing the capacity of lymphocytes to migrate within the lesions. This failure to up-regulate the adhesion molecule CD11a resembles the phenotype of two mouse strains, CBA/J and DBA/2, that we have previously described as reactivation-susceptible (10). The reduced expression of CD11a on T cells from CBA/J mice is a systemic effect as shown in this study and previously (10). That the IL-10 trangenic mice did not exhibit reduced CD11a expression in the spleen (where the level of IL-2 induction, and thus IL-10, is reduced due to low levels of infection and thus, immune stimulation) supports the hypothesis that it is IL-10 expressed at the site of infection that is limiting the expression of CD11a on the T cells within the lungs of the IL-10 transgenic mice. Therefore, these studies identify the overproduction of IL-10 as a potential correlate of reactivation tuberculosis in the mouse model that results in the characteristic phenotype within the lungs that is seen in the naturally reactivation-susceptible mouse strains. The loss of lymphocyte foci within the lungs of IL-10 transgenic mice appears to have a significant impact on the integrity of the lung lesions as the course of infection ensued. The absence of localized T cells and the loss of Ag-specific IFN-γ production appeared to be directly associated with the gradual increase in bacterial load within the lungs. 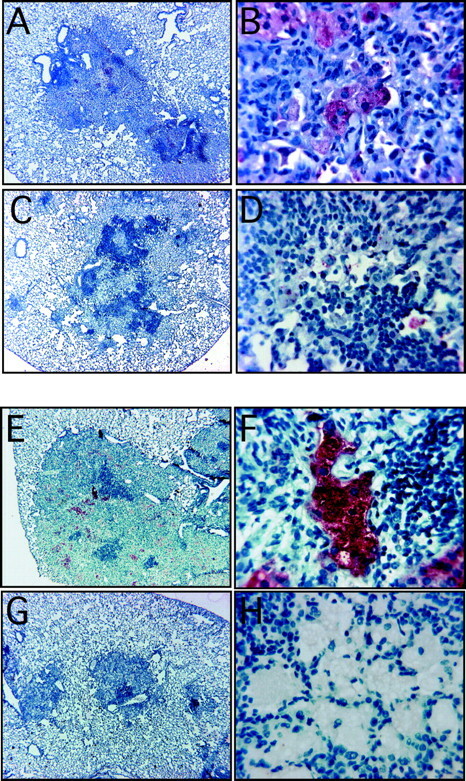 As this occurred, lung lesions in the IL-10 transgenic mice were dominated by macrophages and with progressive degeneration, characterized by necrosis and neutrophil influx. As such, these lesions closely resembled the macrophage-dominated lesions that we have previously described in two reactivation-prone mouse strains (10). The overexpression of IL-10 within lesions of the lung, whether via transgene expression or as a result of IL-10-producing macrophages within the lesions, thus clearly predisposes these mice to enter a stage of reactivation disease. The identification of immune correlates of protection/susceptibility to tuberculosis in the mouse model takes on particular importance if these findings can be extrapolated to man. The identification of individuals that have the potential to reactivate a latent M. tuberculosis infection, perhaps by a significant increase in their capacity to produce IL-10, may help identify individuals who will go on to develop reactivation disease later in life and hence be a source of infection. Therapeutic treatment of these individuals with drugs or perhaps with anti-IL-10R Ab (49) could potentially prevent reactivation tuberculosis and thereby reduce the index cases for infectious tuberculosis within the community. In support of this concept, elevated levels of serum IL-10 have been reported in individuals with active tuberculosis (19) and in the pleural fluid of tuberculosis pleurisy patients (18). In addition, elevated IL-10 levels appear to be greater in individuals that are coinfected with M. tuberculosis and HIV (50, 51, 52), which reflects the ability of both M. tuberculosis and HIV to stimulate IL-10 production during infection (53). Therefore, observations that the production of IL-10 is associated with the development of active (or reactivation) disease in man are in keeping with the findings of the present study, which demonstrate that increased susceptibility to reactivation tuberculosis in the mouse model is strongly influenced by the expression of IL-10 during the chronic or latent phase of the infection. ↵1 This work was supported by National Institutes of Health Grants AG-06946, AI-44072, and AI-41922. A.K. is sponsored by Conselho Nacional de Pesquisas-Brazil. ↵3 Abbreviations used in this paper: CFP, culture filtrate protein.